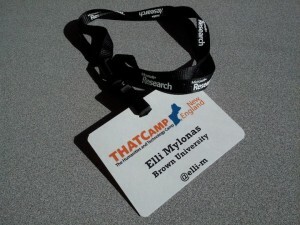 Thank you to everyone who participated and for a wonderful THATCampNE experience! For anyone who took the Regular Expressions workshop, I’ve updated the workshop webpage with some new links and an edited and annotated transcript of everything I typed in that you saw up on the projector screen. The transcript includes 215 lines of code that you can copy and paste into Python, along with 332 lines of annotation to explain what’s going on. There’s even a new section at the end that deals with printing out the word-frequency structure that we computed at the end of the workshop. I also updated the example code, zombify.py and pitchfork_scraper.py, with extra annotations. Thanks for such a great weekend of discussions and learning, and I hope some of you who were at my workshop get some use out of the updated materials. a product from the undergrad curriculum workshop! I thought I would share the notes I took this morning during Jadrian Miles’ excellent workshop Regular Expressions, Text Processing, and Web Scraping. The notes include the a key to general RE commands, annotations on lines from the python scripts we used in the workshop (available here: cs.brown.edu/~jadrian/thatcamp/), and annotated versions of some of the regular expressions we entered directly into the command line. There are also links to the RE tutorials Jadrian recommended. Hopefully these will be a useful reference to others who attended the workshop, and maybe even peak the interest of those who weren’t there! Where does the design process for an interactive exhibit start? How do you simplify a complex concept to work as a children’s exhibit? What goes into the software engineering of an interactive exhibit? I would like to propose a session about the ethics of data visualization. How, given new digital tools, can we honestly represent our research? What are the obligations as a researcher in conducting collaborative research and project development with people whose lives we are representing digitally? How do we construct a methodology(ies) in the field of digital humanities that does not do violence to the subjects of our research? What are key new tensions that emerge between researchers and subjects when using data visualization? We’re hoping to see you all tomorrow morning, ready for a day of workshops that will culminate in a hackathon followed by a well deserved beer. Perhaps even a walk downtown after the beer to see an exhibit of multimedia installations. And then there’s Saturday! Here in Providence, we’re getting ready and trying to make sure that all will go swimmingly. Here are some things that will help you prepare. It’s all on the website – All information is on the site – parking, locations, session proposals, schedules. Look it over. If you need more information on something, make a comment, tweet a question. Please look over the Workshop page before Friday! Have you updated your profile? Looked at the other profiles? Have you thought about doing a Lightning Talk? No need to sign up now, you can get in line on Saturday morning. They’re short, sweet, and a great way to get your work or ideas out there. 2 minutes. Workshops – any suggested preparations are linked from the Workshop description, take a look and download the necessaries for the workshop(s) you are interested in. Bring a rain jacket. We’ll be walking around. Forecast for warm, but rainy. Check the forecast on Wunderground or the National Weather Service. Parking: See “Around Brown” page also “Locations” page. Are you on Twitter? That’s the best way to see what’s going on in other sessions/workshops, ask questions, see where everyone’s going for lunch… [Is Twitter new territory? Maybe that’s a session proposal right there!] 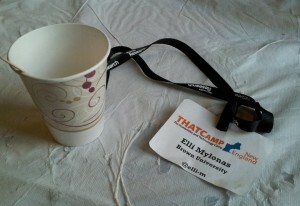 Our Twitter hashtag is #thatcampne. Categories: General	| Comments Off on Preflight!